confections containing kudzu starch(powdered arrowroot), bracken starch and kanten(agar). Kudzu starchand bracken starch are expensive, so most of their commonly-marketed products contain popato starch in appreciable quantities. a jelly-like confection made from bracken starch and covered or dipped in kinako (sweet toasted soybean flour) with kokutou(黒糖,black cane sugar) syrup. Being produced in small quantities, the starch is expensive. It's like a translucent, sticky and firmer jelly. It is made by stirring water containing the starch and sugar into sticky paste on heating. After making it, I became sweaty all over and have sore muscles. Although it becomes doughier by stirring many times, I made this quickly in a microwave. a confection made from wheat gluten and powdered sticky rice. Japanese confectioners apply a small amount of the glaze in the palm of their hands and wrap a ball of bean paste with the glaze. We place the glaze into the water before wrapping it because the glaze is very hot like candies in process of making. It's unadvisable to cool confections containing kudzu starch for hours in the refrigerator, because the transparent confections become white translucent by cooling. Kudzu-mochi(葛餅,a pudding-like kudzu starch cake) is very popular among confections containing kudzu starch. 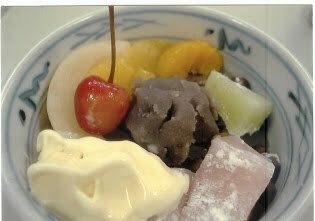 Anmitsu is served in a bowl with small cubes of kanten jelly, boiled red peas, sweet azuki bean paste, colored gyuhi(求肥) and a variety of fruits such as peach slices, mikan and cherries. We eat them with kokutou syrup. Gyuhi is rice cakes that have soft skin made of steamed refined rice flour and sugar. Cream anmitsu is anmitsu with ice cream on top. Kanten(agar or or agar-agar) is a white translucent jelly made by hardening an decoction of seaweeds such as tengusa or ogonori and becomes transparent by adding sugar. It's altered by the addition of an acid. Powdered kanten is convenient. Confections containing kanten and sugar can freeze well, although confectioners don't recommend their freezing. Kanten is approximately 80% fiber, so it was used as diet food and was sold out at many stores years ago. Products named "Agar" in Japan consist of carrageenan which is made from an decoction of another seaweeds. It remains unaltered by the addition of an acid. Being also viscous and water-retentive, so it's used as thickener or stabilizer for food. This is more nishikigoi(錦鯉,varicolored carp) than goldfish. Unlike gelatin, kanten solution cakes at room temperature. So we need to increase work pace. But sinking the fishes into the hot kanten solution causes the fishes floating on the water. Timing is everything. Mizuyoukan(水羊羹) is also popular as a summer confection. Youkan(羊羹) consists of sweet bean paste, kanten solution and sugar. It can be stored for about a month at room temperature, so it was used as wartime or maritime light diet. However, mizuyoukan have a higher water content than youkan, so it cannot be stored for quite a while. Natsu-giku is one of small chrysanthemums which come into bloom in early summer. This is covered with kanten glaze. This confection consists of small cubes of kanten jelly containing black cane sugar and shiratama(白玉, rice‐flour dumplings).